Beatboxing: Using MRI to compare a beatboxer's sounds to language. Babeli and Ball-Zee in a tag team freestyle. 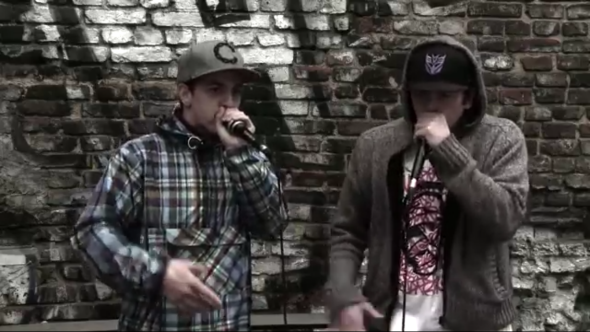 Beatboxing doesn’t sound a lot like language and, well, that’s sort of the point. It’s supposed to be an a cappella version of the percussion section, not a coded set of lyrics. However, since the human vocal tract—including the palate, tongue, teeth, and other mouthparts—is used for both beatboxing and speaking, linguists at the University of Southern California wondered to what extent beatboxers draw on actual speech sounds. To find out, they put a professional beatboxer in a real-time MRI machine. The resulting cross-sections of the beatboxer’s mouth and throat show a range of sounds, all linguistic, but only some of which are found in the beatboxer’s native language (in this case, both English and Spanish). Inside the mouth of a beatboxer. In the first picture, the tongue is in a neutral position, so the air flows smoothly out along the dark open part and doesn’t produce any noise. The tongue then raises up to touch the soft palate, near the back of the roof of the mouth. In the third image, the beatboxer continues to hold his tongue against the soft palate while building up air pressure behind it, as indicated by the slightly bigger space behind the tongue, before releasing it along with the extra portion of air that follows the [k] sound. Finally, the tongue ends up back in the resting position shown in the final image. What’s interesting is that you don’t have to speak a language with clicks in order to happen upon them as a beatboxer. Since there are only a limited number of ways that the human vocal tract can move around, chances are that when you start experimenting with different sounds you’ll end up producing some that are used by a language somewhere in the world, even if it’s not your own. What’s more, German has a K-like sound that’s produced with a tiny open space at the back of the mouth, as in Bach and achtung, an effect that isn’t typically found in English (except in Scottish words like loch) but is useful for the percussive noises of beatboxing. And if Google Translate had the ability to read aloud a language like KhoeKhoegowab, Xhosa, or Zulu, we could even get the clicks!